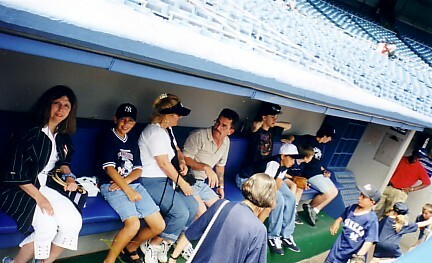 Lucille, far left, with friends and family in Yankee dugout. On a bright, sunny, warm late-June day, I headed a group of 21 family and friends on a guided tour of Yankee Stadium. Each member of our group had his or her own favorite ballplayer (in my case, Lou Gehrig); each of us bringing our own hopes and dreams to the outing, and I readily admit I was looking for any and all Lou Gehrig memories or mementos. Having been Yankee fans of long standing, we knew we would see all the famous spots in this "cathedral" of ball playing. We were anxious to see the press box, the clubhouse, the dugout, the field itself and, of course, famous Memorial Park. None of these places disappointed us, but there was a surprise in our tour that none of us ever expected. We Yankee fans know all about ballplayers who claim they feel the presence of all the Yankee greats who have played on that hallowed ground. I have read these quotes from both the Yankee players and their opponents, believing it but not really giving it too much thought. On the tour, though, I wanted to feel this presence. But I knew one could not force such an issue. If the ghosts were there and wanted to show up, they would do so with no help from me. All the tour stops had their highlights. Memorial Park is very similar to visiting a museum/cemetery (in a good way). The field has been roamed on by the best baseball has to offer. The dugout has been sat, spat, and slept in by all the Yankee legends. The clubhouse walls are privy to all the secrets we would love to know. Although all these places were exciting and fun to visit, they did not have that certain something - I had not yet felt the presence. Cathedrals in general all have their secret walkways, staircases, buried bodies, and this New York baseball church, I found out, is no exception. After visiting the clubhouse, the next stop on the tour was the Yankee dugout. To get there one must go through an under-the-stands tunnel. This tunnel is a dingy, dirty, old dungeon (not unlike a NYC subway entrance), but much to my surprise, this is the place. As I had made all the arrangements for the tour, I was afforded first place in line behind the tour guide. When I stepped into the tunnel, immediately chills, goose bumps and that eerie feeling that someone was watching came over me. I knew instantly that Lou's spirit was there. A picture of the poignant scene in Pride of the Yankees, where "Lou" (Gary Cooper) walks down this very tunnel right before his famous speech flashed through my mind. I realized this was it. This was real. I was feeling the presence. I drastically slowed my walk, not wanting this moment to end. The tunnel is very narrow, making it possible for me to slide my hands along the length of its walls - a gesture which fulfilled my need to feel every inch of this very special place. It was as if Lou was talking to me, introducing me to his workplace. I had an extraordinary need to be in this presence, to make this moment last. I wanted to stay in that dingy tunnel, continue to experience an undeniable closeness with my hero. I had found Lou's spirit, an indescribably emotional moment which I won't ever forget. When the tour ended, we all congregated outside the stadium. Although I was quite curious to know if my tour mates had experienced any similar feelings in the tunnel, I am also by nature a bit of a skeptic and have a degree of self-consciousness (not unlike my hero, Mr. Gehrig). So I was not about to voice my feelings, lest they think me nuts. I need not have worried. One by one my tour mates lined up to not only thank me for arranging the tour, but more so to tell me about their experience in the tunnel. My sister-in-law, not a big baseball fan, was first in line to express her thoughts. She related how she felt all the hair on her body stand up and how she had gotten goose bumps in that tunnel. My younger sister, a huge baseball and Yankee fan, explained how she thought the whole thing was wonderful, but "the tunnel was amazing; all the greats are there." My older sister, a deeply Christian woman, noted, "They are in that tunnel." I was starting to see a pattern, but I still wasnt convinced everyone felt the presence of Yankee greats in that tunnel. For me the clincher came when my husband, not at all a baseball fan but learning, told me he felt chills and goose bumps while walking through that clubhouse-to-dugout tunnel. Then I knew. I truly had found the presence and Lou's spirit. Gehrig being Gehrig, so earnest and so focused on playing every day, would naturally pick this particular place in which to haunt or reside. Where every player from every era for every game played at Yankee Stadium must walk, no way around it. It is quiet, out of the way, a totally non-intrusive place, so plain, simple and functional - so Lou. My mission accomplished, I found Lou's everlasting spirit. To me it is in that Yankee Stadium clubhouse-to-dugout walkway which I simply call The Tunnel. See also Tour of Gehrig's Yankee Stadium for pictures and such. "They are in that tunnel."